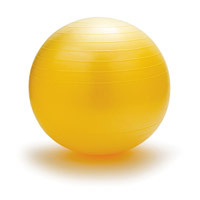 The use of exercise balls (also known as a pilates ball) have grown greatly over the last several years. In addition to being able to perform most exercises that incorporate the use of dumbbells, the exercise ball also forces the individual to balance on the ball properly. This demand of balancing incorporates several muscle groups used in oblique exercises, ab exercises, and lower back exercises. It should be noted that these muscles will not be used as primary muscles but more or less at a tertiary level because the lifting motion is not directly applied to them but they are required to keep the body steady. In order to retain correct posture and lifting technique, the exercise ball selected should be of proper diameter based on one's height. Aside from it's use as a device to perform exercises on, the exercise ball can also be used to perform exercises with. Using the exercise ball to add weight (by clutching it between the feet) to the lower body can take an exercise like leg raises to a whole new level. Care should always be taken before and while performing exercises, especially while on an exercise ball. Prior to use, inspect the ball to ensure it is properly inflated. It should have some give but not sink to the floor. This is important because if a great amount of weight/force is applied, the ball could be so depressed that it does not allow for proper lifting technique. At the same time, it should also not be rock solid, if the internal pressure is greater than the recommended amount, the ball could burst like a balloon if enough weight/force is applied. When performing exercises on an exercise ball, ensure that the workout area has been cleared around the ball. An exercise similar to dumbbell bench press (but on the exercise ball) is a great example of how mounting the ball can lead to the ball moving out of place. Additionally, it is more difficult to calmly place the dumbbells down on the ground after completion of the set due to the spherical nature of the ball.